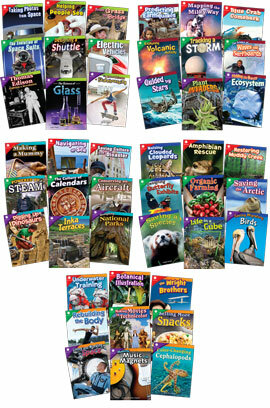 Each book highlights every component of STEAM: science, technology, engineering, the arts, and mathematics. Students will make STEAM career connections through career advise from Smithsonian employees. With dynamic images and intriguing text features to enhance the reading experience, this set will engage students' minds and imaginations. The hands-on STEAM challenges are ideal for makerspace activities and guide students through each stage of the engineering design process. The real-world examples give students insight into how the engineering design process is used to solve real-world problems. What steps are required to plan and create a butterfly exhibit? How is organic farming better for the planet than traditional farming? Created in partnership with the Smithsonian Institution, this 9-book set devoted to animals and ecosystems builds students' literacy skills while fostering curiosity, creativity, and innovation. If you were traveling to space, what would you wear? How do satellites give us images from space? Created in partnership with the Smithsonian Institution, this 9-book set devoted to creative solutions builds students' literacy skills while fostering curiosity, creativity, and innovation. How are National Parks designed to accommodate millions of visitors while preserving their natural beauty and resources? How did the Inka control water for farming? Created in partnership with the Smithsonian Institution, this 9-book set devoted to history and culture builds students' literacy skills while fostering curiosity, creativity, and innovation. Did you know astronauts train in water before going to space? How have modern technologies like 3D printing changed prosthetic devices for the better? Created in partnership with the Smithsonian Institution, this 9-book set devoted to animals and ecosystems builds students' literacy skills while fostering curiosity, creativity, and innovation. How do scientists study the Milky Way galaxy? How are meteorologists able to predict the weather? Created in partnership with the Smithsonian Institution, this 9-book set devoted to the natural world builds students' literacy skills while fostering curiosity, creativity, and innovation.